Wear a kimono in Matsushima! Wearing kimono is popular in traditional Japanese places. One of the three most scenic spots in Japan, Matsushima is a Michelin Guide 3-star (highly recommended) destination, and is a must-see for anyone traveling to Japan. Enjoying such a wonderful location is even more exciting when strolling around town in a kimono. Take in the traditional buildings and the natural beauty of Matsushima Bay. 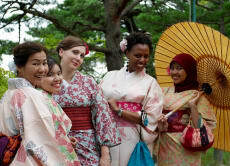 Wear a kimono or yukata in Matsushima!